Age truly is a number for Patricia Rickard, 76, a Baldwinsville, NY resident whose contemporaries are mostly retired. She tried that once. She operated Korros, which taught performing arts to children with hearing impairment. But as her encore career, she founded PAR Horticulture Consulting Business. Rickard uses her education to help clients plan — and achieve — the landscape of their dreams. Cultivating her green thumb started as a young girl. Rickard said that her father was an exceptional gardener with whom she spent a lot of time growing plants. She pursued education as her career path and taught at Gallaudet University in Washington, D.C., among other venues. Rickard speaks glowingly of her days as an educator and continues to write educational materials to this day. 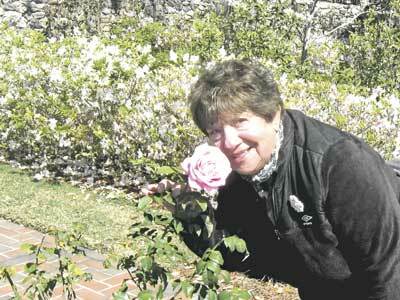 After 50 years of teaching, she retired and returned to school to learn about horticulture. She earned an associate degree in Landscape Technology and Horticulture with honors from the Montgomery Community College in Germantown, MD. She interned at the prestigious Longwood Gardens in Kennet Square, PA. When she applied to go there, she wasn’t sure if those reviewing her application would question her age and ability to keep up. But she said that after her acceptance, Longwood Gardens personnel were impressed with her energy. “I was probably one of the oldest interns they ever took on,” she said with a laugh. The long days — 7 a.m. to 4 p.m., plus three hours of coursework at night — proved rigorous, but Rickard counts this as one of the “peak experiences” of her life. She also worked at a few garden centers before opening her business in 2012. Rickard enjoys entrepreneurship and couldn’t be happier. She helps clients plan what they want, guiding them with ideas that will work with the various environmental factors present on their property. “I don’t go in with a pre-existing plan, but I go according to the clients,” she said. Many times, she takes clients to the plant nursery to show them what can work with their properties. One of her larger clients owns 43 different properties managed by maintenance people. That’s where her educational background has come in particularly handy, as she must train them how to care for the plants. Some clients simply want her to come in and work her magic and that’s okay, too. One of her clients likes sunflowers, plants she would normally never consider planting in a formal garden, but she acquiesced because it pleases the client. Below the tall plants, she planted Echinacea to attract butterflies and bees as the birds harvest the seeds above. Rickard uses employees only when she needs them. She advises people interested in starting a horticulture business to obtain the right credentials first. It takes a lot more than a big pick-up truck, shovels and rakes. “You need to know what makes a plant grow, how it needs to be fertilized, where to plant it,” Rickard said.